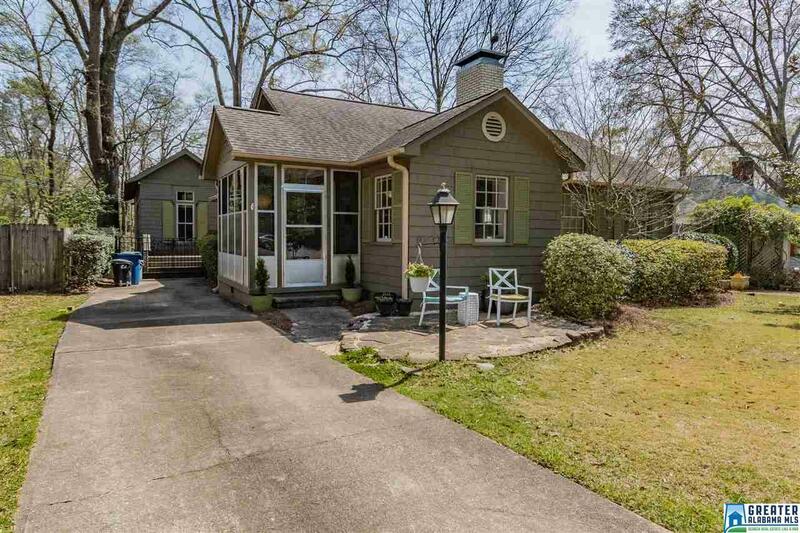 621 Oxmoor Rd, Homewood, AL.| MLS# 843909 | Richard Jacks UABLIVING.com 205-910-2297 | Birmingham AL Real Estate | Contact us to request more information about our Homes for Sale in the Birmingham AL area. What?!? 2 houses for the price of 1! Classic Edgewood Cottage features living room w/hardwood floors, fireplace, built-ins & abundant natural light. Formal dining room leads to large eat-in kitchen w/breakfast bar, tile floor & custom cabinets. Master bedroom w/master bath & his/her closets. Spacious 2nd bedroom & full bath for kid/guests. PLUS a separate family room/den with 2nd fireplace. Enclosed front porch can be used nearly year-round! BEAUTIFUL architect designed/custom built 1Bed/1Bath guest house w/living space & kitchen, perfect for mother-in-law suite or rental for extra income! Both houses combined offer a total of over 2,100 sqft feet of living space! Great outdoor space as well! Relax under the beautiful, old magnolia tree or chat w/ neighbors on the stone patio. Enjoy BBQs on the back deck & watch kids/pets play in the fully-fenced back yard. Outdoor shed for storage. 5 minute walk to Edgewood Elementary! Easy stroll to Saw&apos;s, TacoMama, NewYork Pizza, Gianmarco&apos;s, etc! Driving Directions: From Palisades/I65: Oxmoor Rd; Rt On Broadway; Rt On Shades; Bear Rt At Forest; Rt On Morris And Rt On Old Oxmoor Rd; House In Cul-De-Sac.